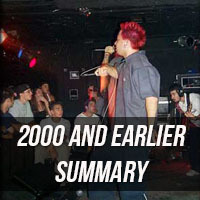 Before the year 2000, Linkin Park was called Xero and had Mark Wakefield as their singer. Thanks to Anna Shinoda sending us flyers and ticket stubs in 2013, we now know of six Xero shows in the years 1997 and 1998. In 1999, the band brought Chester on board and played shows in California and Arizona (four of which are listed). The Madison, Wisconsin date unfortunately is unconfirmed and we don't know if the band made it outside of those two states in 1999 or 2000. Sometime after the Tempe, Arizona show on May 27, 2000 and the Hollywood, California show on June 9, 2000, Hybrid Theory changed their name to Linkin Park. Unfortunately no setlists are known for any Xero or Hybrid Theory shows. Other than "Reading My Eyes" (Xero), we don't know what either band was playing at their shows. Linkin Park began 2000 with a few shows here and there, mostly playing to hometown crowds in the Los Angeles area. They embarked on their first tour ever, opening for Union Underground on their An Education In Rebellion tour in July. The tour lasted until mid August, with the band playing a few one-offs still touring. Phoenix was not with the band from the start of the first tour (actually even before that) until November, when they started their Kings of the Game tour supporting P.O.D. because he was playing with Snax. LP supported the Kottonmouth Kings all of September and October before picking up Phoenix again in November. The songs they played were selections from Hybrid Theory (excluding "Crawling" and "Pushing Me Away") and also And One from the Hybrid Theory EP. To this day it is unknown whether "Carousel" or "Part Of Me" have ever been performed live. The band headlined its first MAJOR show in Westminster, CA, when they headlined the KROQ Jocks Signing Calendars show on November 11. The band had to cut back the length of the show the night before in New York so they could catch a plane to get to California in time. After playing a few more radio shows, LP joined Papa Roach on their Master Bay Tour and concluded the year on a high note after playing at the KROQ Almost Acoustic Christmas in 2000 for the very first time, where they debuted a new song, "My December". After two more California shows, the band was done with their first major year of touring and now was ready to take on the nation again in 2001 with the release of Hybrid Theory. The setlist for the year was pretty basic, with just the same nine songs being played with a little variation. "By Myself" appeared mid-tour later in the year, but it's possible that the song was played before they started touring nationally, too. The year went without many problems as far as we know. We know that their tour bus broke down in Kansas (thanks Frat Party DVD haha, even though we're sure it's happened way more than once) and we know they canceled two dates - one in St. Petersburg, Florida and one in Columbus, Ohio, both because of family emergencies. Otherwise, the year was pretty productive for Linkin Park! Note: it is unknown which Xero or Hybrid Theory (band) songs have been performed live except Reading My Eyes and And One. Papa Roach's Master Bay Tour 2000: Papa Roach, (hed)p.e. 2000.09.15 St. Petersburg - Reason: A band member had a family emergency to attend to. 2000.09.26 Columbus - Reason: Chester had a family emergency to attend to.